Last season the Denver Broncos made a bold move by selecting two-time BCS champion and Heisman trophy winning quarterback Tim Tebow in the first round of the 2010 NFL draft. This move by former head coach Josh McDaniels was heavily criticized by NFL analysts and Broncos fans around the country due to the fact that the consensus was that Tim Tebow was not a quarterback that would be able to transcend his talent on the NFL level. Despite all the criticized and extra media attention geared towards the Denver Broncos for making the decision to draft the young quarterback with a high draft pick, Tim Tebow embraced the challenge of proving everyone wrong and becoming the starting quarterback of the storied NFL franchise. Ever since the retirement of two-time Super Bowl champion quarterback John Elway, the Denver Broncos have been desperately looking for a promising young quarterback to come in and fill Elway’s shoes. The Broncos thought they had found that quarterback in Jay Cutler a few years ago, but the Cutler era in the Mile High City ended when McDaniels came to town and fell out of favor with his quarterback. After the Denver Broncos traded Jay Cutler to the Chicago Bears for Kyle Orton and superstar wide receiver Brandon Marshall to the Miami Dolphins, the team basically had to start over with Orton under center. Even though there were a lot of doubts that Orton could replace Cutler under center, the veteran quarterback played pretty well and is still considered the best quarterback in Denver. Once the NFL lockout ended, the quarterback controversy began in the Mile High City with everyone talking about second-year quarterback Tim Tebow becoming the starter and Kyle Orton potentially being traded to the Miami Dolphins. The trade involving Kyle Orton going to Miami seemed to be set in stone with Dolphins fans getting extremely excited about a proven starter coming to South Beach. Despite most people believing that it was a matter of time before Orton was sent packing, the trade fell apart and the veteran quarterback was right back in the middle of a quarterback controversy in Denver once again. With the talk of Tim Tebow becoming the starter and the future face of the franchise, the consensus was that it wouldn’t be long before Tebow was bumped up to the number one spot on the depth chart by new head coach John Fox. 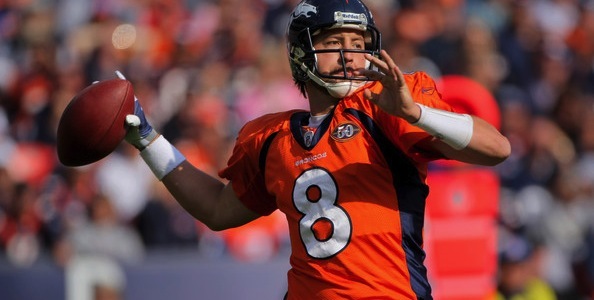 Even though it seemed like a forgone conclusion, the fact remained that Kyle Orton was the best option and now has officially been named the Denver Broncos starting quarterback. Not only is the quarterback controversy in the Mile High City finally over with Kyle Orton winning the starter role once again, but now Tim Tebow has become the third quarterback on the depth chart behind Brady Quinn. This came as more of a surprise that Orton getting the starting job as Tebow was thought to have made some strides during the preseason, but it appears he has only made matters worse with poor play in practice and two better quarterbacks ahead of him.